This 3 hour tour gives you both a really good sense of what life is like in Toronto, while also showing you some of the great highlights of the city. 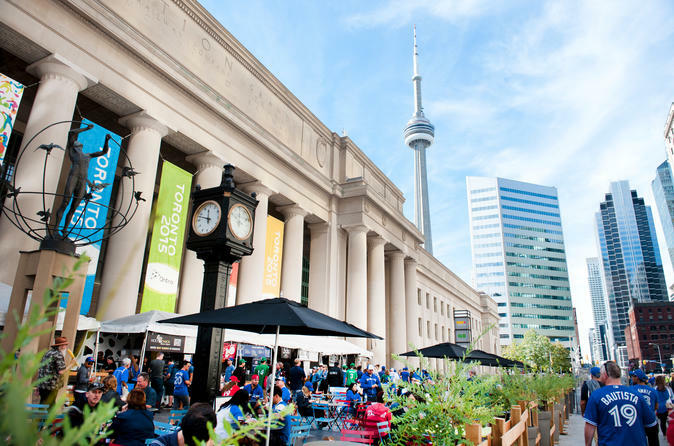 On this tour we will some great historic and cultural sites such as the Royal York Hotel, Union Station and the St. Lawrence Market, Harbourfront and the Entertainment District Along the way you will hear some great stories of Toronto's history, culture and way of life. This tour begins at Roy Thomson Hall – the home of Toronto’s Symphony Orchestra. The tour then makes its way through the Entertainment District of the City. This is home to Toronto’s live theatre scene, major sporting events, the Toronto International Film Festival, hundreds of restaurants and bars and much of the city’s renowned nightclub scene. The tour makes its way to the railway lands. Once a sea of endless railways and trains, it is now home to the Canadian Headquarters of many leading global software companies. We will walk past Toronto’s only remaining railway roundhouse which is home to Toronto’s Train Museum. The tour then makes its way to Toronto’s harbourfront. Only 30 years ago, harbourfront was home to grain elevators, refrigeration buildings and huge warehouses. The city received the land as a gift from the Federal Government, and has through the years transformed this area into a waterfront park for residents and guest alike. At this point of the tour, there is a short break so tour guests can do something of interest for themselves , be it, taking incredible pictures, visiting an artist hub, or dropping by a modern art museum. The tour then continues back into the city on Toronto’s Path System (a 30 km/ 20 mile network linking the majority of building in Toronto). We visit Toronto’s Union Station, the main train station in the city. At 90 years old, the station is nearing the completion of a multi-year, billion dollar makeover. The tour then begins its final stretch with a stop at Brookfield Place. This is home to the Hockey Hall of Fame, as well as the Allen Lambert Galleria – arguably one of the most beautiful spots in the city, designed by Spanish Architect Santiago Calatrava. We arrive in Old Town with its 200-year old architecture. We see one of Toronto’s great new attractions, “the Dog Fountain”, we see both sides of Toronto’s famed Flat Iron Building and we end the tour at Toronto’s famous St. Lawrence Market. Selected by the National Geographic as the world’s greatest food market. We will show you some of our favourite spots in the market, and will leave it to you to have a look and decide for yourself what you would like to try.